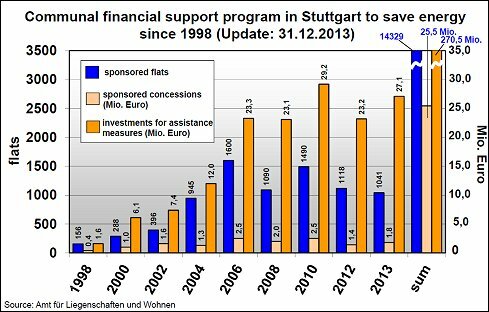 Thanks to a newly worked out energy saving programme, the city of Stuttgart supports the renovation of flats and houses. Comprehensive energy saving measures are funded with a maximum amount of € 4,200 per flat, provided that an energy diagnosis has been made. For this, an energy consultant rates the state of the flat or house and of the heating and hot water system and makes recommendations for how to save energy as well as money. This diagnosis is made by the energy advice centre EBZ in Stuttgart (www.ebz-stuttgart.de ) as well as by the technical control association of Southern Germany (www.tuev-sued.de ). In order to make most efficient measures more attractive, the amount of subsidies correlates with the level of saved energy. Funds from the city cover at most 20 % of your recognised expenses. If you wish to carry out single energy saving measures, like adding insulation to the attic or outer walls or replacing leaking windows without having made an energy diagnosis, this new support programme funds you from now on with a fixed sum of 8 €/m2 of renovated or replaced surface. For the renewal window, you receive a lump-sum subsidy of 20 € per m2 window area. 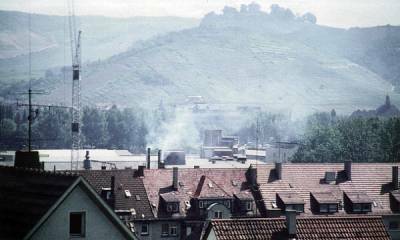 The support programme covers the whole area of Stuttgart except for officially defined development and redevelopment areas. For more detailed information or a support request form, please contact the real estate and housing office: Amt für Liegenschaften und Wohnen , Heustraße 1, D-70174 Stuttgart. Ms Brigitte Riegger and Ms Ursula Vogt can help you and can be reached at 0049-711-216-91372 and 0049-711-216-91374. Flyer: "Promoting energy modernization in residential buildings"
A lot of older buildings have no adequate insulation. To improve your home’s energy efficiency and comfort, just add insulation to the attic, outer walls and windows. EnBW, a leading German power supplier, also grants subsidies supporting energy saving measures. Information on various other support programmes offered by the Land of Baden-Württemberg or by the state government is given by the EBZ as well as by the Energy Information Centre (IZE, Phone: 0049-711-123 2526). The KfW banking group (Kreditanstalt für Wiederaufbau) supports investments aiming at the reduction of carbon dioxide emissions. 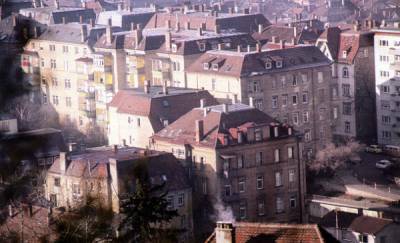 The KfW grants low-interest loans for the renovation of flats and houses thanks to a 1 billion euro subsidy from the federal budget. One of their programmes supports the complete renovation of buildings. Homeowners have to accept a package of measures to be taken, combining measures like insulation and the modernization of the windows and heating system. The carbon dioxide emissions of a renovated building have to be reduced by 40 kg / m2 of floor space. Investments are subsidized up to 100 %, including additional expenses for the architect and energy consultant. The maximum support is 250 € / m2 of living space. Heating still wastes a lot of energy. Replacing your old furnace by a modern and more efficient heating system means significant heating savings and fewer emissions. Another programme supports individual measures increasing the energy efficiency of a building, like improving the insulation of the attic, renewing the windows, installing a condensing furnace or a combined heat and power system or a system using renewable energy sources. In this case, the investments may also be covered up to 100 % by the KfW. A third programme for individual support is the construction of an energy efficient house which consumes no more than 40 or 60 kW/h of primary energy per square metre of living space a year. If a new house is to be built, the maximum support is 30,000 €, or 50,000 € for a building with a maximum energy consumption of 40 kW/h per year. Support request forms for the various support programmes are available at banks and savings banks. Private persons, local authorities, districts as well as housing companies can apply for these programmes.